Pharyngitis; Laryngitis; Strep throat; Bacterial, Viral, Fungal & Yeast infections of the throat; Respiratory infections (nose/ throat & lungs); Tonsillitis; Mouth blisters related to influenza; Hoarseness; Loss of voice. 1) Bee Propolis Natural Antibiotic. Works effectively, even in cases where the bacteria have developed resistance to modern antibiotics. 2) Echinacea (Angustifolia + Purpurea) Anti-microbial, anti-viral. Especially useful for infections of the upper respiratory tract, such as Laryngitis, Tonsillitis & for Catarrhal conditions of the nose & sinus. 3) Sage (Salvia Officinalis) Antiseptic. It is a classic remedy for inflammations of the mouth, throat & tonsils, soothes mucous membranes. An excellent remedy in Laryngitis, Pharyngitis, Tonsillitis, Quinsy & mouth ulcers. 4) Red Thyme (Thymus Vulgaris) Anti-microbial. 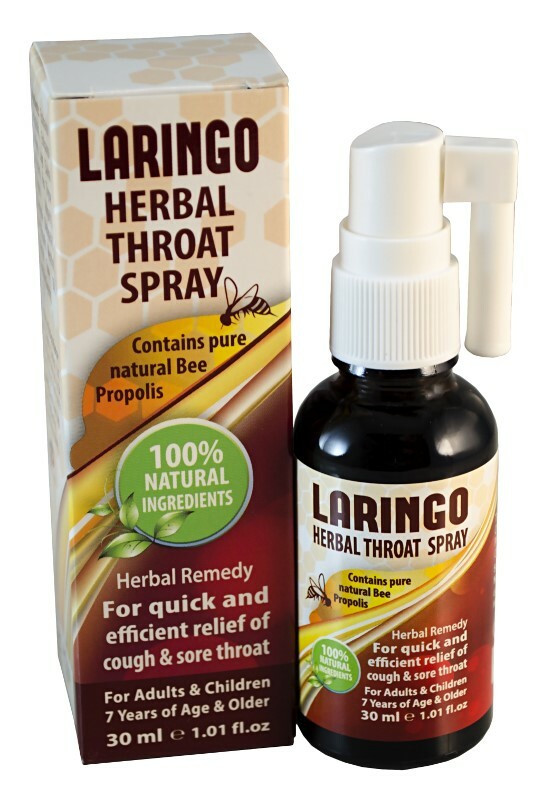 It is a special remedy in Laryngitis & Tonsillitis. Eases sore throats. Throat and mouth irritations effectively soothe an irritable cough. It is an excellent cough remedy! 5) Chamomile (Matricaria) Soothes sore throats. 6) Menthol Has a soothing and analgesic action. 7) Essential Clove Oil Has a pain reducing, anesthetic action. 8) Vegetable Glycerin Used in the preparation as a light natural sweetener.